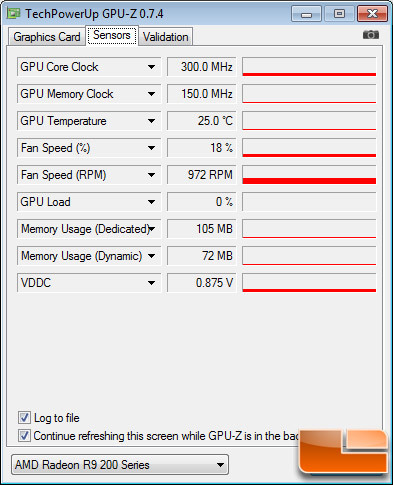 The MSI Radeon R9 270 Gaming OC was found to idle at 25C with the fan running at right around 975 RPMs. The Sappphire Dual-X R9 270 OC wasn’t too far off that with an idle temp of 28C, but the fans were spinning at 1120 RPMs! It should be noted that the ambient room temperature was 22.0C (72F). The MSI Radeon R9 270 topped out at just 57C with the fans running at 1240 RPMs when gaming on it for an extended period of time. The Sapphire Dual-X R9 270 hit 60C with the fans running at 2144 RPM.The clear winner when it comes to temperatures would have to be MSI as their card runs at a higher clock speed and runs cooler despite the fans spinning lower. Remember that MSI is using 95mm fan blades versus the 74mm found on the Sappphire Dual-X GPU cooler. 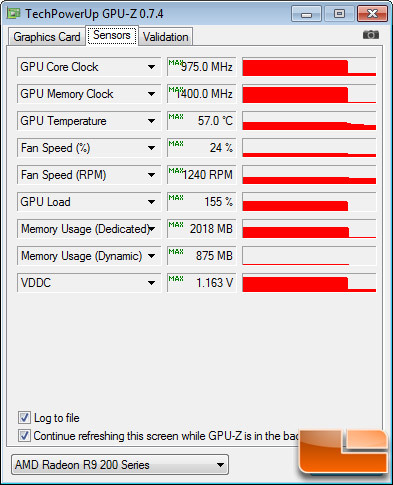 After reviewing a bunch of the AMD Radeon R9 290 and R9 290X cards and seeing 94C load temperatures it is nice to once again see low temperatures! 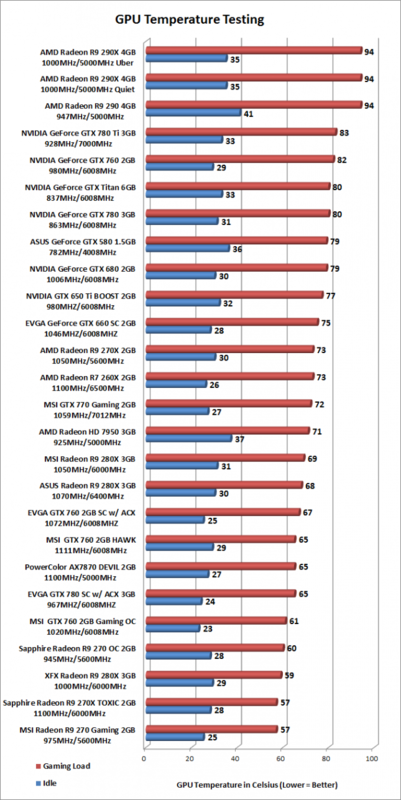 We must have gotten a high leakage AMD Radeon R9 290 video card as our idle and load temperatures were pretty toasty. The AMD Radeon R9 290 has a temperature target setting of 95C by default and our reference card topped out at 94C when gaming and 41C when at idle. 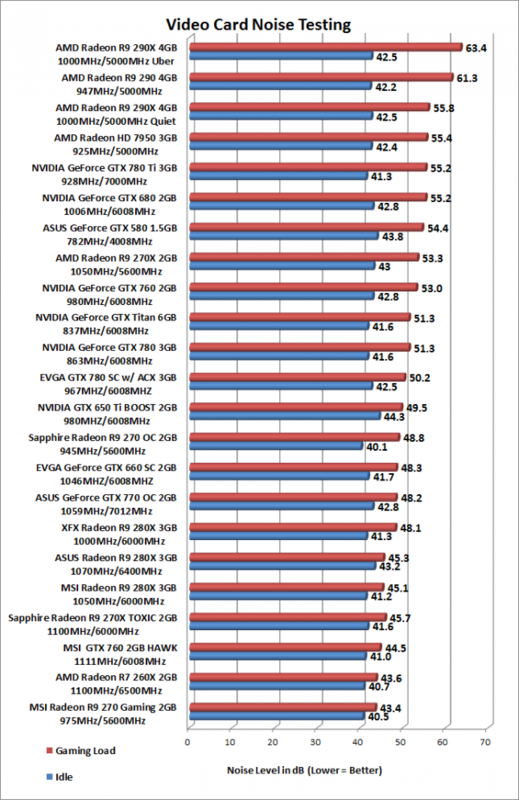 AMD said that the Radeon R9 290 and 290X should be about the same when it comes to temperature, but our Radeon R9 290 was running noticeably higher at idle. In fact, this is the highest idle temperature that we have seen in some time. We recently upgraded our sound meter to an Extech sound level meter with ±1.5dB accuracy that meets Type 2 standards. This meter ranges from 35dB to 90dB on the low measurement range, which is perfect for us as our test room usually averages around 36dB. We measure the sound level two inches above the corner of the motherboard with ‘A’ frequency weighting. The microphone wind cover is used to make sure no wind is blowing across the microphone, which would seriously throw off the data. The fan speeds and actual fan blade sizes greatly differ on these two Radeon R9 270 graphics cards, but we were shocked to find that the idle fan noise was pretty much identical at just over 40 dB. When gaming though the MSI R9 270 Gaming fans only spun up to 1240RPM whereas the Sapphire Dual-X R9 270 OC fan blades went up to 2140 RPM. You can easily hear this 900 RPM different and so our sound meter confirmed this by noting that the Sapphire card was over 4dB louder when gaming. Both have acceptable noise levels and are certainly quieter than your average card.